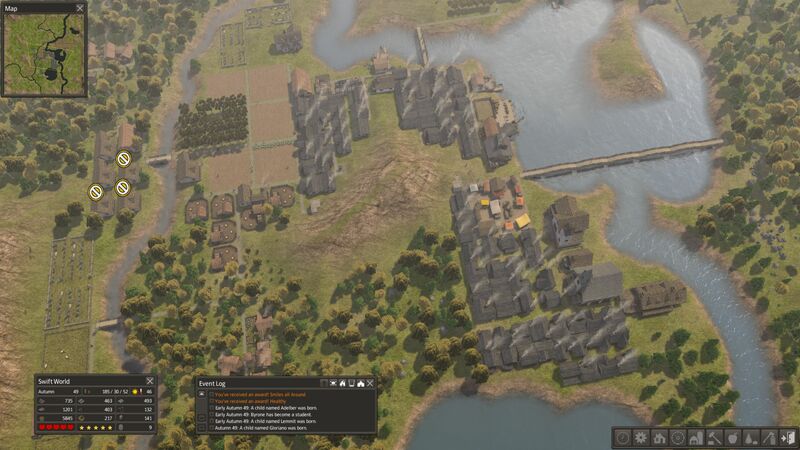 There are many great games within the city building genre. 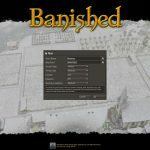 Banished isn’t a game that introduces anything new or unique but it does what it does rather well. 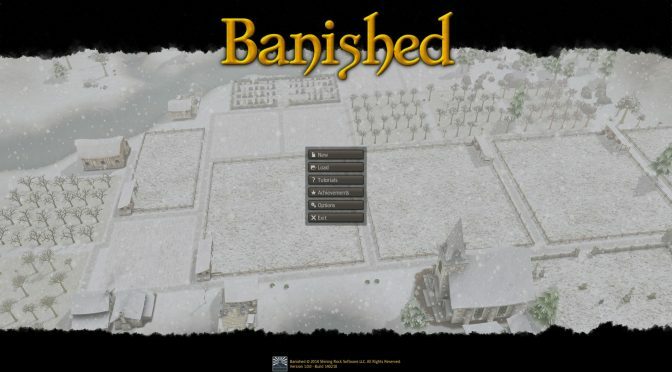 The game puts the player in the medieval time where you will take control of a few villagers that were banished (hence the name) from their homeland (or something like that). In order to survive and possibly grow, it is up to you, the player, to build the right amount of everything and ensure that everyone has their basic needs fulfilled. The difficulty of the game only varies at the very beginning. Once you get everything up and running you should be doing fine. 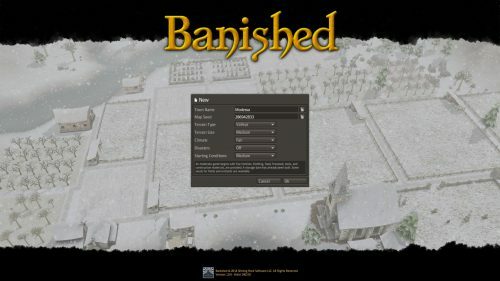 At the start of a new game, you can select the type of place you want to start a village in. There are two different options here, one in the mountains where terrains are extremely terrible for building anything and resources aren’t as readily available compared to the other option, the valley. In the valley, you get flatter land and more water. It is much easier to build a village in such conditions. The next difficulty modifier is the things you start off with. There are three different options, the easiest giving you livestock to start with amongst other things and the hardest with basically nothing (not even seeds for farming) but just people to work with. I started my game in the medium difficulty which gives you people and some basic stuff to start off a village. The other two options are the climate conditions (mild, fair or harsh) and whether you want disasters enabled or not. The game features a randomly generated map (using a bunch of random numbers that you can input) with customizable sizes big enough to play till you’re bored. Map sizes are definitely more than sufficient for the amount of content the game has at the moment. Let us move on to some of the mechanics of the game. Now the game doesn’t exactly have the easiest of learning curve but it isn’t that bad either. While it does have a tutorial that explains the basics of the game, there are still many things not covered. There is an in-game manual that definitely helps but I would strongly suggest players to simply trial and error and if you fail the first time, just learn from it. That’s part of the fun. A lot of things in the game is technically common sense. For example, you don’t expect an orchard to grow immediately so you do not invest your resources or manpower in maintaining one at the start. Crops also require time to grow and, once harvested, needs to grow again; the cycle repeats. The way resources are managed is extremely logical and is one of the fun aspects of the game once you manage to get a hang of it. There are a variety of ways to get food and they each have their own advantages and disadvantages. 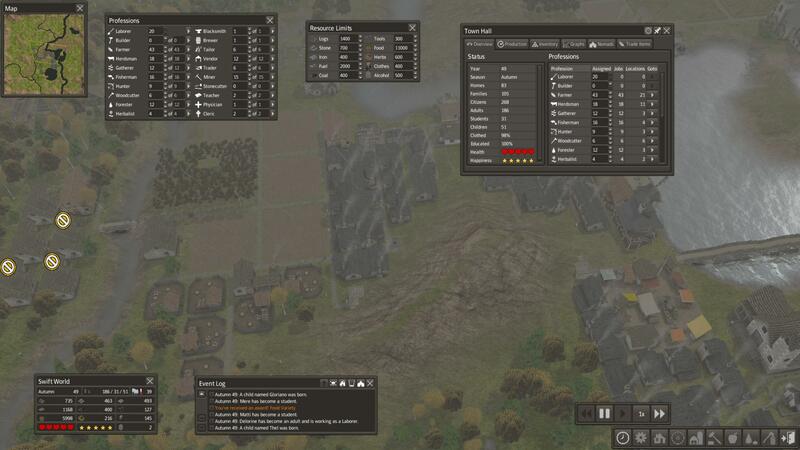 You will have to carefully plan how to distribute your manpower and the positions you place certain buildings. Take note that there is a season system implemented and it works as how real life should. Crops get planted during spring and will grow and get harvested before winter. During winter your crop fields will not be in use at all so make sure there is sufficient food to survive winter (or at least other sources of food coming in). There are two aspects that you will need to be concerned with in regards to your citizens. That is health and happiness; the former being the more important of the two. Health can be maintained at the highest should you have sufficient food, clothing, housing and warmth. Once the basic necessities are fulfilled, citizens should be healthy enough to survive and only die due to old age. Of course there comes a time where a sudden disease outbreaks. You will thus have to ensure that you have sufficient hospitals to treat your people in the case of such an outbreak. The next thing is happiness. Happiness is achieved when luxuries of the people are met. Say there is sufficient food but only one type, people are not going to be happy. They won’t go hungry but eating the same thing over and over again will make them sad. Having a variety of food is one of the ways to keep your people happy. 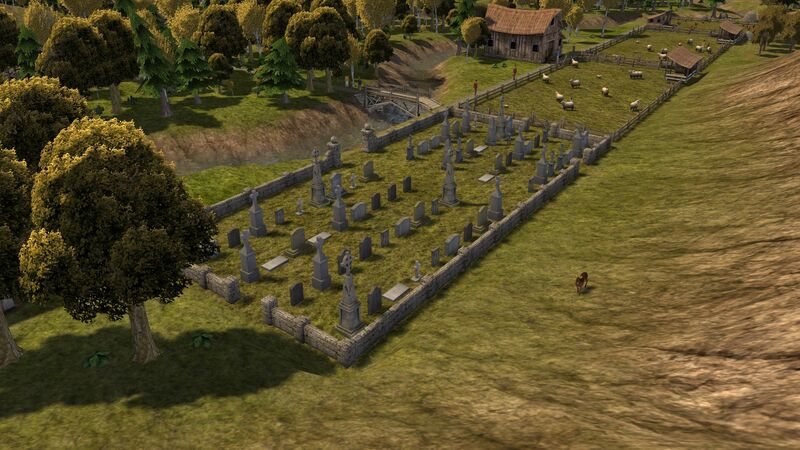 There are other things such as the tavern to brew ale to drink and things like sufficient cemetery slots for the dead; all of these will help keep the people happy. Once you progress through the game you can start being more specialized and use the trading port to your advantage. For example, you can simply be like a clothing supplier and mass create clothes to trade for food and resources. Trading introduces another mechanic to the game that allows players to take a different approach as to how they go about managing their village. Specialization can only come in the later stage of the game as no matter what you will still have to get the basic resources yourself before you can even start building the trading port. 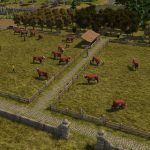 The trading part also allows players to unlock more types of crops and livestock via trading for seeds or livestock when a merchant arrives. The next thing you will need to manage is the population. At the start it is quite simple. Build a house if you want more families and babies, build less and you will limit growth. It is to the later stages of the game where things get slightly more complicated and interesting. Once you start building schools, people will only join the workforce at an older age. Children will first go to school to get educated before graduating and then working. It is thus extremely important to have a right balance of working adults, students and babies. You will also have to manage with the situation of people dying whether it is due to work accidents or old age. Everything is linked and thus a balance must be achieved somehow else things will start to fall apart. These core mechanics, while simple as they sounds, does make the game pretty interesting and enjoyable. I guess that’s what most city builders are anyways. The ways you go about maintaining a high level of happiness and health do makes things slightly more interesting. You simply have to find a right balance of everything. The logic of the game is realistic. For example, more people means more food is required; too many old people and too little young means you’re facing with an aging population. Resources and population management comes hand in hand and it is up to you to ensure the cycle of life and work is maintained properly. There are also other tiny bits and pieces of mechanics in the game that keeps the game even more interesting. For example there are times where crops do not grow as well as they should. Harvest will thus be lacking and it is up to you to ensure that there is sufficient backup else your people will suffer. There is the treat of crops being damaged by pesticides and thus it is wise to not have all the same types of crop in the same place (different crops have different resistance). Since most things are made of wood, there is always a chance for a fire to outbreak thus the need for a well to ensure that fires get put out before they spread out of control. All these mechanics do spice the game up and keeps things fresh. The game does well in terms of menus and shortcuts. There are sufficient key bindings for you to quickly access vital information at any time you want. Menus are pretty self-explanatory and tooltips, while being extremely basic, do their job in telling you what exactly each icons are. Statistics are only available when a certain building is built. 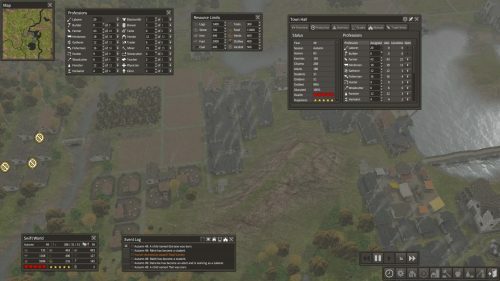 Other than that, there are all your other basic city building information like a mini-map, workforce distribution, the availability of resources etc. Here comes the major problem of the game. The mechanics and concept of the game is only enough to keep you entertained for that few hours (20 plus possibly?). Things start getting monotonous and boring as soon as you hit the mark where all you do is basically to repeat whatever you did at the beginning to further expand your village. There are achievements in the game but that isn’t sufficient reason for me to push on any further. 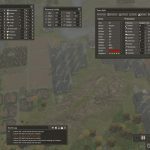 I have built everything single thing available in the game and that doesn’t say much because there isn’t that many to build anyways. All you do once everything is done is to rinse and repeat. 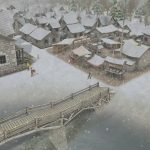 While a city building game doesn’t need to have any kind of goal or mission, it should have enough things to build or do to keep things exciting. 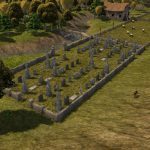 The limited choices in buildings and progression means that the game can only be played that much. Sure you can challenge yourself to not use certain buildings (to obtain certain achievements) but needing to see the same old things over and over again will ultimately make it a more tedious playthrough rather than a challenging one. That said, there is mod support coming to the game and that will definitely be a saving grace. 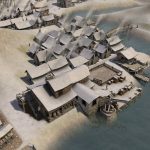 The community that backs the game is rather large and is still growing. 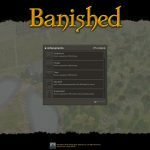 Mods will come and the game will definitely grow and improve in terms of gameplay and replayability. As for now there is simply too little to do in the game and it doesn’t really warrant another playthrough. Game graphics aren’t the best but it is sufficient enough to not complain about it. 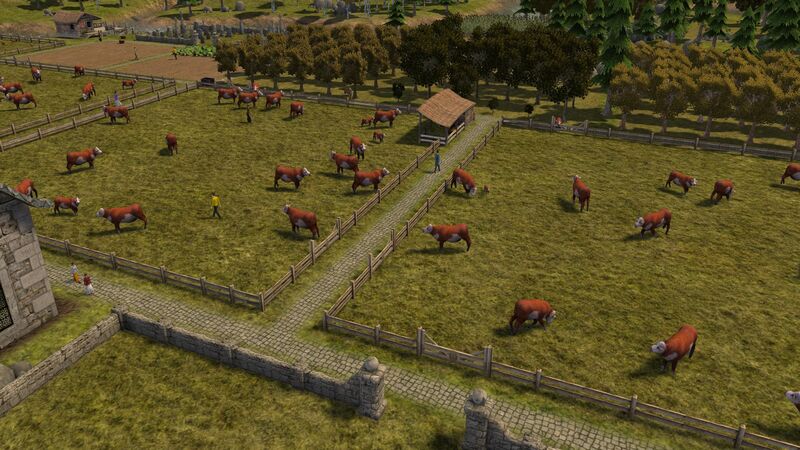 Animations of the people moving and working, livestock grazing the fields and other bits are basic and simple. 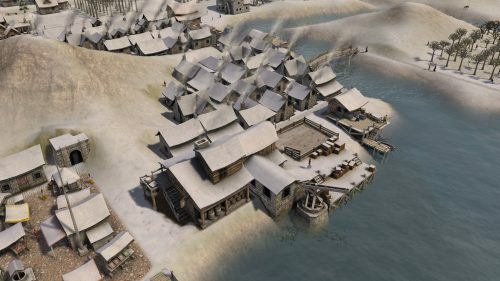 The different seasons and weather conditions also brings about graphical changes; for example in winter buildings and landscapes will be filled with white snow. Ultimately, it is nice to see the amount of effort and detail the developer has put into it. There are times when the game does look pretty good especially when you have everything up and running. Zoom out slightly and you will get that kind of satisfying view a city builder game provides. You can simply sit back and admire the work you have put into getting everything up and running. It is nice, the end product that is, but again that’s all there is to the game at the end. In terms of sound effects and the background music, the game does alright. Cows go moo and sheeps go baa. People make noise while working and trees tumble to give that crashing sound. 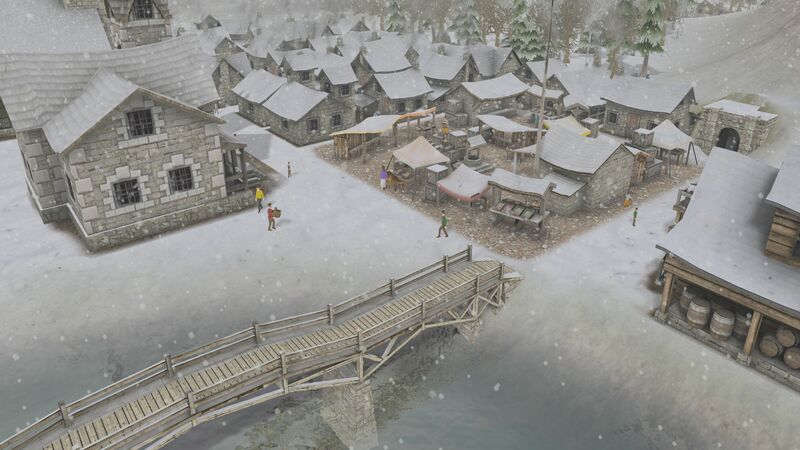 There are very basic sound effects put in place but it is there to further liven up the game experience and make the village feel more alive. There is this background game soundtrack that does suit the gameplay and overall theme but you might want to run your own music once you hit that few hours mark. 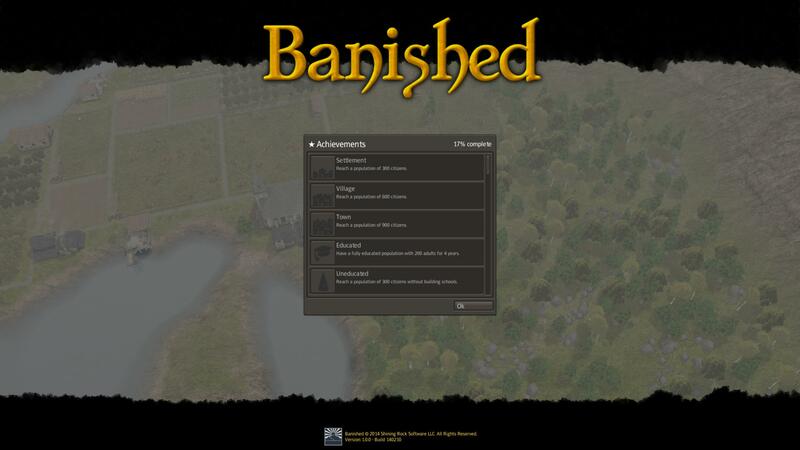 Overall, Banished is a pretty good game and an amazing feat for a one man team. The end game isn’t exactly there yet and there is definitely much more room for improvement. 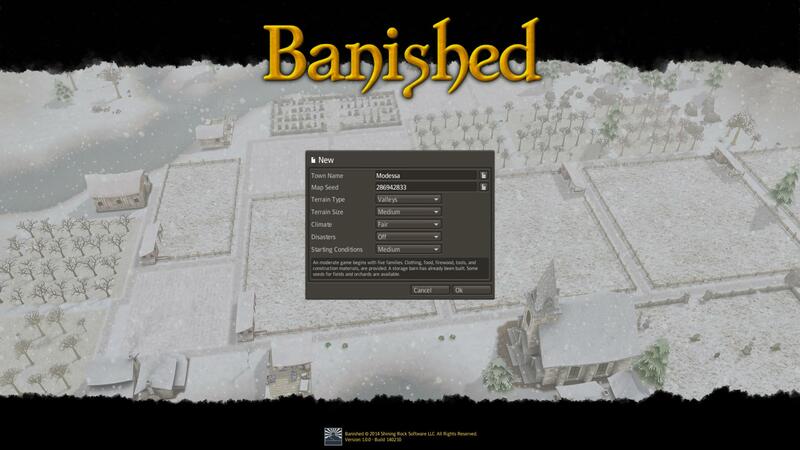 As of now the core mechanics and concept does carry the game through the initial few hours but if you’re looking for a city building game that you want to keep playing over and over again, creating new cities every other day, Banished has too little to offer to keep you entertained. 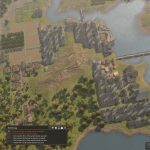 Things will change though once mod support arrives and should there be a dedicated community backing it, the game will definitely be on any city building fan’s list. If you have some spare change (the game isn’t costly at all) and time to game, you can consider purchasing the game and then once you get bored, keep it till mod support arrives. For the rest, perhaps you can wait for a steam sale of that sort or for mod support to arrive before considering purchasing the game.